Scene 5 can be split into two sequences, Ophelia's descent into madness and Laertes' return (though the latter eventually dovetails into the former), so we'll take them separately. Scene 5 is the scene by which we judge all Ophelias and indeed, it is her last. She thereafter only appears in the story of her suicide as told by Gertrude, though of course, films often show us something of that action. Though the difficulty for the actress is obvious, there's also a difficulty for the director because Ophelia's madness manifests as snippets of old folk tunes. What melodies does one use, and how do these change the way we understand and interpret the songs? Before addressing the relevant performances, let's look at the text itself. As usual, the Bard is in italics, and my comments break through unitalicized. QUEEN GERTRUDE: I will not speak with her. Some time has passed since Polonius' death and Hamlet's exile, enough that the Queen doesn't want to deal with Ophelia anymore. This line is often forgotten because Gertrude does indeed go on to see Ophelia, but it is nonetheless there. Is the Queen annoyed, tired or afraid? That's up to each actress, but there is cause for any or all those feelings. QUEEN GERTRUDE: What would she have? There is, in the Gentleman's speech, the mirror of how an audience can, should and does infer meaning in poetry (and in Shakespeare's plays themselves). Ophelia's speech is "nothing", meaningless, and yet the human mind cannot but try to give meaning to it. This is a wonderful preamble to a scene where the audience (and the characters in the scene) are asked to do just that. We will look for poetical meaning, what Ophelia feels about her lover killing her father, but the King and Queen may be looking for something else - Ophelia leaking the very information they tried to keep quiet by sending Hamlet away, or else implying the Royals had something to do with it (something gets back to Laertes, who has that distinct impression when he returns to Elsinore). In fact, Horatio seems to be of the same bent. QUEEN GERTRUDE: Let her come in. OPHELIA: Where is the beauteous majesty of Denmark? QUEEN GERTRUDE: How now, Ophelia! QUEEN GERTRUDE: Alas, sweet lady, what imports this song? OPHELIA: Say you? nay, pray you, mark. This one is about her father, clearly, and in the next interrupted line from the song, she sees him in a white shroud. It's a symbol of purity that implies her father wasn't guilty of anything, nor deserving of his fate. It seems the fault all lies on Hamlet's shoulders. QUEEN GERTRUDE: Alas, look here, my lord. Note the connection made between the flowers on her father's grave and those she will hand out in the next sequence, and the garlands that are part of her death scene. KING CLAUDIUS: How do you, pretty lady? OPHELIA: Well, God 'ild you! They say the owl was a baker's daughter. Lord, we know what we are, but know not what we may be. God be at your table! There is a strange legend about a baker's daughter who was transformed into an owl after being stingy to Jesus Christ, which is what Ophelia refers to. It's possible Ophelia blames herself for her father's death (after all, it was his theory that she was the cause of Hamlet's madness), so this allusion of transformation is appropriate. Tragic or extreme events can unlock our true form, just as these have unlocked her madness. More dangerously, she might be implying the King has yet to show his true colors. KING CLAUDIUS: Conceit upon her father. An indication that Hamlet took her maidenhead. She's a maid (a virgin) in the first half of the song, and in the second, her lover is rising from the bed and putting his clothes on, and she leaves, no longer a maid. 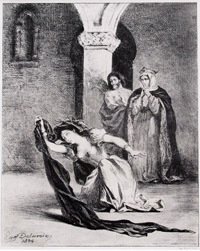 If staging it so that Ophelia and Hamlet never consummated their relationship, Ophelia could instead be referring to a loss of innocence caused by her father's murder, or else visualizing a reality that might have been had the events of the play not occurred. The next song, however, pretty much seals the deal. The meaning is fairly clear. Hamlet has already made love to her on the pretext that he would marry her later anyway. Events prevented the latter from happening, so Ophelia is doubly betrayed, both as a daughter and as a (potential) wife. KING CLAUDIUS: How long hath she been thus? OPHELIA: I hope all will be well. We must be patient: but I cannot choose but weep, to think they should lay him i' the cold ground. My brother shall know of it: and so I thank you for your good counsel. Come, my coach! Good night, ladies; good night, sweet ladies; good night, good night. There are too many references to Hamlet in Ophelia's songs for her father's death to be the only cause of her distress. It's actually quite amusing that Polonius spent the better part of the play insisting Hamlet's madness was due to neglected love, while in truth, it was his father's murder that pushed him over the edge. Now, Ophelia's mad and it's Claudius insisting the complete opposite. He thinks her father's murder is to blame, but it may well be that neglected love is the more potent reason behind Ophelia's tears. Foreshadowing Fortinbras' attack, possibly? While the King is distracted by single threats like Hamlet (still a threat because his exile has caused the populace to whisper rumors) and Laertes (whose ear these rumors have reached), he misses the bigger danger completely. Here we should address the idea of putting poison in one's ear, which was Claudius' method for murdering Hamlet Sr., and the poetic justice of the King being threatened by metaphorical poison poured in Danish ears. Because the truth of Polonius' death could not be revealed, Claudius fears the rumors (poison) has reached Laertes and may fuel a rebellion. Claudius uses the word "ear" again and again as his anxiety mounts, a sort of veiled confession only we can decode.